Catalonia’s chief of police Josep Lluis Trapero is appearing before a judge in Madrid on suspicion of sedition against the state. 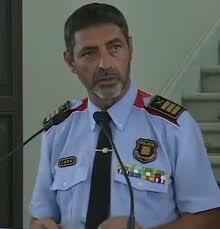 His Mossos d’Esquadra force is accused of failing to protect Spanish national police from protesters ahead of the October 1 independence referendum. Another Catalan police officer and two leading independence activists are also being questioned as suspects. Catalonia’s independence vote was declared illegal under Spanish law. The hearing is taking place at the national criminal court in Madrid. The defendants are accused of failing to help Guardia Civil police tackle thousands of pro-independence protesters outside the Catalan Economy Department in Barcelona on September 20. According to El Pais, the accusation against the Mossos is extraordinary in post-Franco democratic Spain. The crime of sedition has been in every Spanish penal code since 1822 and carries a potential prison term of up to 15 years. It amounts to rebellion against state decisions or national security forces. As recently as August the Mossos was being widely praised for quickly tackling the Islamist cell that carried out the Barcelona terror attack in that month. Following October 1 vote the Catalan regional government says it might unilaterally declare independence within days. Spain’s PM Mariano Rajoy will chair a cabinet meeting to discuss the next moves in the confrontation with Catalonia. Referendum organizers put the turnout at 42%, with 2.2 million people taking part. They say 90% voted for independence, but have not published final results. There have been several claims of irregularities. There was violence at polling stations as police, trying to enforce a Spanish court ban on the vote, attempted to seize ballot boxes and disperse voters.